That is such a pretty start! I know what you mean about some fabrics. I don't like anything that is real stiff to stitch on. This one has lots of pretty pinks in it. I will love watching your progress! My humble opinion is that if you don't like the fabric, try another! I definitely have likes and dislikes with linens. I'll try and use Cork linen or Floba instead of Heatherfield. It's the 100% synthetic of Heatherfield you're probably reacting to. I'm with you on the Heatherfield...don't like the feel of that stuff at all! Love your blog! Your knitting is superb! Since I use Q Snaps, I guess the feel of the fabric doesn't really bother me. I'd be more concern over how the colour look against the design. However, stitching in hand would be a real pain if you don't like the feel of it. Change it if you feel like it. Better that than having the pleasure of stitching ruined. I can certainly understand about that fabric! I feel the same way sometimes. I find that if you stick it out the finished product is always worth it! I think the fabric looks lovely - what fabric is it? I have asked my LNS to order this chart for me, after seeing it on your blog earlier in the week. Nicole, if you don't like the fabric, get another. 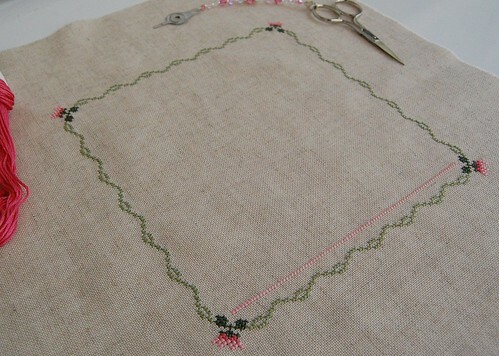 It's important to enjoy your stitching while you're stitching. Am loving that design though and am planning on getting it myself. After all, my birthday is coming, and I'm getting stash for it. Nice start - it's a great colour fabric - shame you don't like the feel of it.